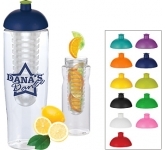 Why buy printed fruit infusers! 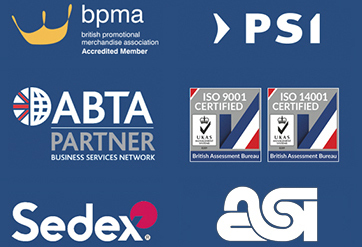 Promoting your business is a crucial step in the right direction if you want to build a successful brand. 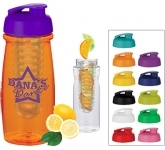 However, there are many promotional products out there, and all are effective in one way or another. Thus, it's vital to figure out which one is the best choice for your target audience. 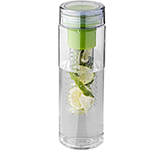 Well, as it turns out, practically everyone loves fruit infusers. And why shouldn't they? Fruit infusers are all the rage now since everyone has jumped on the "get healthy" bandwagon. So, in essence, your target audience would get something that's not only practical but also good for them. Let's not fool ourselves into thinking that money doesn't matter. Of course it does! What's more, when it comes to promoting a business, we all prefer to do it for the least amount of money possible with the highest returns. Well, printed fruit infusers are a great choice if you want to make sure your investment pays off. These bottles are not that expensive to make. Furthermore, given the fact that they are some of the most practical promotional products out there, you can bet that your target audience will love them. 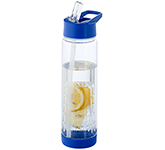 By giving away promotional fruit infusers to potential clients, you'll reach those people that prefer to drink water and keep themselves healthy. And you guessed it - right now, being as healthy as possible is very important. Hence, your investment will prove to be cost-effective, as the ROI you will get will make the money you've spent seem insignificant. 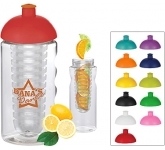 Fruit infusers come in a variety of shapes and sizes, and there are many vibrant colours you can choose from! Therefore, you won't have a hard time designing the perfect artwork with your advertising message on it. 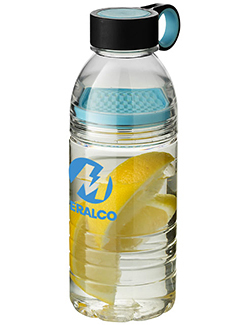 These printed water bottles boast a ton of space for your logo and advertising message, which is quite convenient since most people will carry them in their hands. 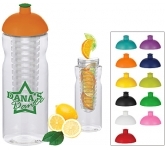 You can bet all eyes on the street will be on these bottles, not to mention that they will draw the attention of visitors at trade shows, exhibitions and other promotional events! 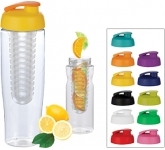 Lastly, we ought to mention that most of these promotional fruit infusers have a low carbon footprint. Therefore, not only will you be helping your audience stay healthy, but you'll also be helping the environment! That is a great opportunity to put your business on the map. Moreover, you'll make sure everyone knows that you are promoting a great cause while at the same time promoting your business and brand values. Essentially, these bottles are your key to success! 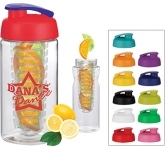 We offer a variety of printing options on our vast range of fruit infusers including screen printing and the very latest in UltraHD photo print technology allowing us to reproduce full colour images and logos to a standard most suppliers can only dream of. Bespoke print options are also available so we can ensure your promotional giveaway not only looks great, but is also a unique attention grabber! 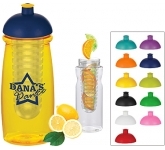 So, if you are looking for low cost, budget, value or cheap printed fruit infuser water bottles, and happen to find the same branded fruit infusers cheaper, with the same print specification and turnaround, just let us know and we will match the price and back it with our industry Award Winning Customer Service - that's our guarantee!! 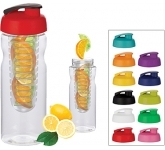 For additional information on our custom printed promotional fruit infuser water bottles or how to use promotional products effectively as part of your marketing strategy, why not contact us and have a chat to one of our friendly dedicated account managers who will be happy to advise you further.